Nine years ago, then-Archbishop Daniel M. Buechlein established a new college seminary in Indianapolis at a time when seminaries had been closing across the country for decades. 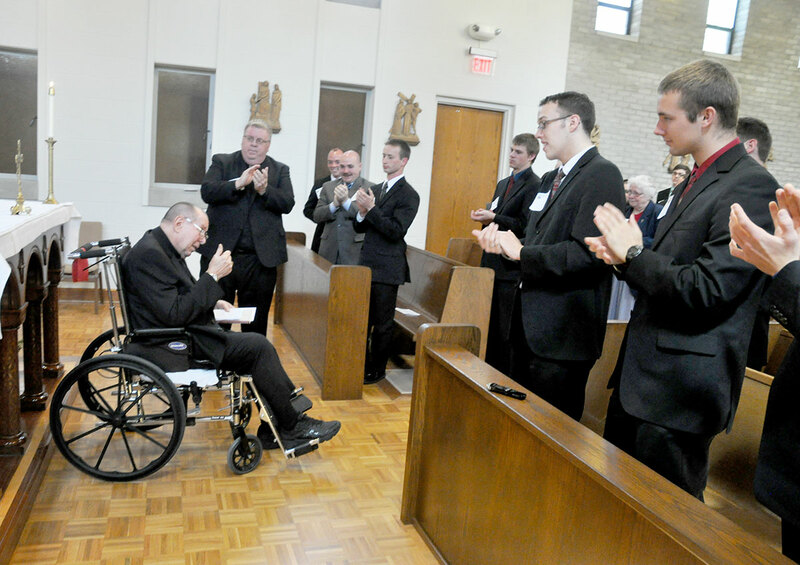 It started in the fall of 2004 on the campus of Marian University with six seminarians. Today, Bishop Simon Bruté College Seminary is housed in a former Carmelite monastery about a mile from Marian, and has more than 30 seminarians from nine dioceses across the United States. On April 21, now Archbishop Emeritus Buechlein was honored at the seminary for the courage and foresight he showed in establishing it. Archbishop Joseph W. Tobin announced that his predecessor’s name will be connected in a permanent way to the seminary’s soon-to-be-completed dining hall. In addition to the new dining hall, a new dormitory that will feature 10 double occupancy rooms is being constructed at the seminary. Both additions are expected to be completed during the summer in time for the start of the fall semester. The announcement took place on what is known as Good Shepherd Sunday, which the Church also observes as the World Day of Prayer for Vocations. Archbishop Buechlein was honored after a mid-afternoon prayer service in the seminary’s recently expanded chapel. Also in attendance were Benedictine Archabbot Justin DuVall, the seminarians, faculty from Marian University and other supporters of the seminary. “He had it right,” Archbishop Buechlein said. He later recalled how he blessed the seminary in 2008 after it moved into the former Carmelite monastery, and prayed at the time that it would become a “school of prayer. Archbishop Buechlein later exhorted the seminarians to continue to grow in their life of prayer. Sitting in the front row listening to Archbishop Buechlein was seminarian Timothy DeCrane, a junior at the seminary and a member of Most Holy Name of Jesus Parish in Beech Grove. Archbishop Buechlein suffered a stroke when DeCrane was a freshman in 2011. As DeCrane has walked the halls at the seminary over the past three years and spent time in prayer in its chapel, he has constantly been reminded of Archbishop Buechlein and Father Robert Robeson, who has led the seminary as its rector since its founding in 2004. The fact that Archbishop Buechlein chose to establish the seminary to help seminarians like DeCrane is remarkable for Father Robeson. At the same time, Father Robeson was, like DeCrane, grateful to Archbishop Buechlein for founding the seminary and appointing him as its rector.